Have you ever entered a quilt into a contest in which it traveled for a period of time? In 2015 I entered the Madison Quilt Expo’s “Fall Leaves” quilt challenge. Part of the entry agreement was the quilt would travel with the exhibit for two years. That’s a long time! My quilt “Which Way Does the Wind Blow” arrived back on my doorstep this past week. What a joy to have it back and hang it up for Autumn! This was the card that traveled with it. The quilt got it’s name because I challenged myself to draft some of the leaves as oddly shaped mariner’s compasses using my “Compass Capers” technique (you can purchase a copy of my book at: http://www.chrisquilts.net/books/). Piecing the leaves was not difficult, but finishing the leafy edge took a bit of perseverance. I lined the back of each leaf and stitched them to the quilt on the leaf veins (compass seams) resulting in a 3D effect. 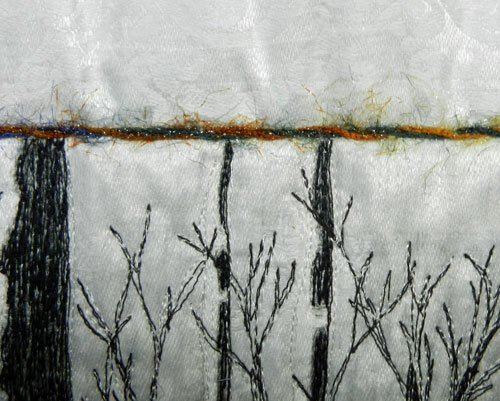 I liked the image of the windblown tree so much, I made a second quilt entitled “Autumn Dusk”. This time the interesting effect was achieved by using an orange/black Pointillism fabric for the sky and water. This may not be the last time I make a quilt with this tree – perhaps there’ll be a series. Stay tuned :-). Have you had a quilt travel? Please comment to this post and let us know! A while ago I presented a program for Common Threads Quilt Guild in Sussex, WI. One of the quilters in attendance was a woman named Colleen. During show & tell she shared a delightful “Row by Row” quilt. “I belong to the Ties That Bind Quilt Guild that meets in West Bend, WI. it was a giant postcard. it off. I decided to go back to the sewing machine and make another row. the quilt while it was on the longarm. I love the way she labeled the back in a post card style. Notice how the place and date are in the “post mark”! Thanks Colleen, for letting me share your quilt. The back is so clever and I love hearing about your process for problem solving! If anyone out there has a Row-by-row you’d like to share, please email me a picture at chris@chrisquilts.net. If you’d like to include a story, that would be icing on the cake 🙂 ! Wishing you a blessed Resurrection Sunday – He is risen indeed! Thank you ladies, for sharing your lovely quilts with us. Rumi is a quilter I met early in my quilt journey, while taking part in my first quilt challenge. This all brought to mind a story I think you’ll find quite interesting and I’d like to present it in two parts. “In early Autumn, 1989, Georgellen Mikkelson was contacted about orgainizing the Madison, WI, end of a quilt challenge between quilters in Freiberg, Germany (Madison’s Sister City), Berne, Switzerland, and Madison, WI. She gathered a varied group of 21 quilters, and anxiously awaited the arrival of the “Challenge Fabric” from West Germany. The participating quilters were each given a 12″ square of each of the fabrics. Five additional fabrics of the quilter’s choice could be used. 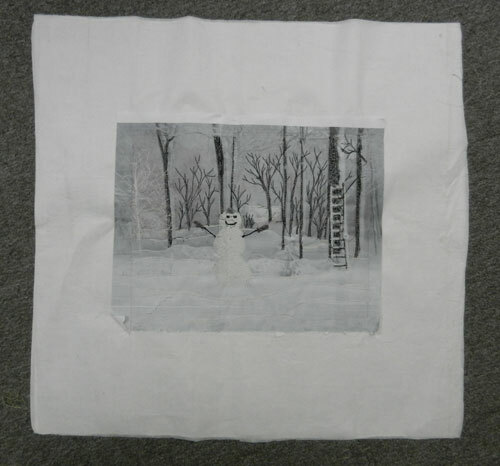 The finished quilts were to be no larger than 24″ x 24″. I found these leftover pieces of the challenge fabric stuffed in a page of the photo album with the challenge pictures. Maybe I had a premonition I’d need them for a blog someday :-)! I enjoyed making my challenge quilt (to see it, you’ll need to read next week’s post for part 2 🙂 ). When it was time to get together and see all the Madison quilts, there was one that really caught my attention. It was Rumi’s. Her quilt told the story of the challenge in hand appliqué! Amazing! And hand quilted too. I was so impressed, I signed up to take a class from her at a local quilt shop. The class was called “Making Babies” and we made 2 little dolls. Rumi was a wonderful teacher and the stories she shared of her life in Japan were delightful. I lost touch with her after that class. A few weeks ago Sommer found those dolls in a toy bin and began playing with them in her doll house. After reading the article about Rumi in the paper, I had to dig out the old photo album and revisit my memories of the challenge and Rumi. I can’t wait to make the trip to Madison and see the exhibit of her quilts. 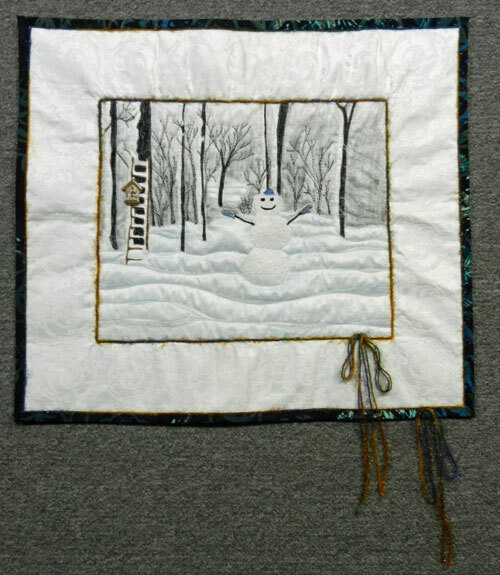 The exhibit is entitled: “Crossing Mountains and Other Adventures – Story Quilts by Rumi O’Brien”. For all the information go to: https://sohe.wisc.edu/research-development/design-gallery/2016-17/crossing-mountains-and-other-adventures-story-quilts-by-rumi-obrien/. Next week: part 2 of the Sister City Challenge! 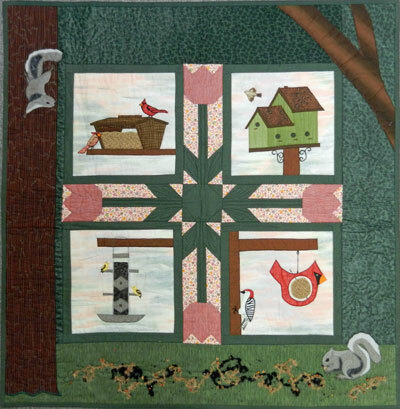 Quilt Round Robin – Anything Goes! Over the years I’ve participated in many Round Robin exchanges in the guilds I’ve belonged to: “Add a Border”, “Row by Row”, and “Around the Square”, just to name a few. Probably the most unique one was held by the Milwaukee Art Quilters and it was called “Anything Goes”. I did a post about it way back in 2010, but I’ll be participating in a new Anything Goes challenge in a new Fiber Arts guild (more info to come 😉 ), and thought it was a good time to revisit this fun idea. So, here are the rules: there are none! Each participant chooses a block, a hunk of fabric, a small failed project, a piece of fabric they’ve dyed or painted – anything goes. This item is placed in a paper bag with some symbol recognizable only to the owner (the owner is not revealed until the end of the rounds), and they are all thrown in a pile on the floor. Everyone picks a new bag, opens it, and pictures are taken for future reference. This works best if there are 4 or 5 in each group, so if you have more participants, divide into groups first. Oh – I forgot to mention, there is one rule – you can’t be upset by what you get back 😀 ! I began with 3 large, hexagon log cabin blocks from a failed 1995 workshop where the teacher discovered half way through that the blocks wouldn’t fit together and the class ended. The fabrics were dated, and I had no idea what else to do with the blocks, so in the bag they went. The first person chopped up two of the blocks and sewed them back together into long strips (the next few pictures were made using Photoshop, because back then we didn’t take step-by-step pictures – they may not be perfect, but you get the idea). The second person thread painted a peacock feather on a new piece of fabric, and bordered it with the pieced unit strip. The third didn’t like it at all, so she chopped everything up again and added a bunch of stuff from her scrap bag. She then cut this new “fabric” into jigsaw puzzle shaped pieces and pinned them onto a piece of black fabric. The fourth artist said she was at a loss for the first 29 days of the month. The last day she stared at it, and was so frustrated, she went out for ice cream. When she returned, she was inspired. She removed a few of the pieces and put a cherry on top! This is how it was returned to me, so I put it in a dish and added the spoon. The handle of the spoon sticks off the quilt and is supported by a dowel in a sleeve. 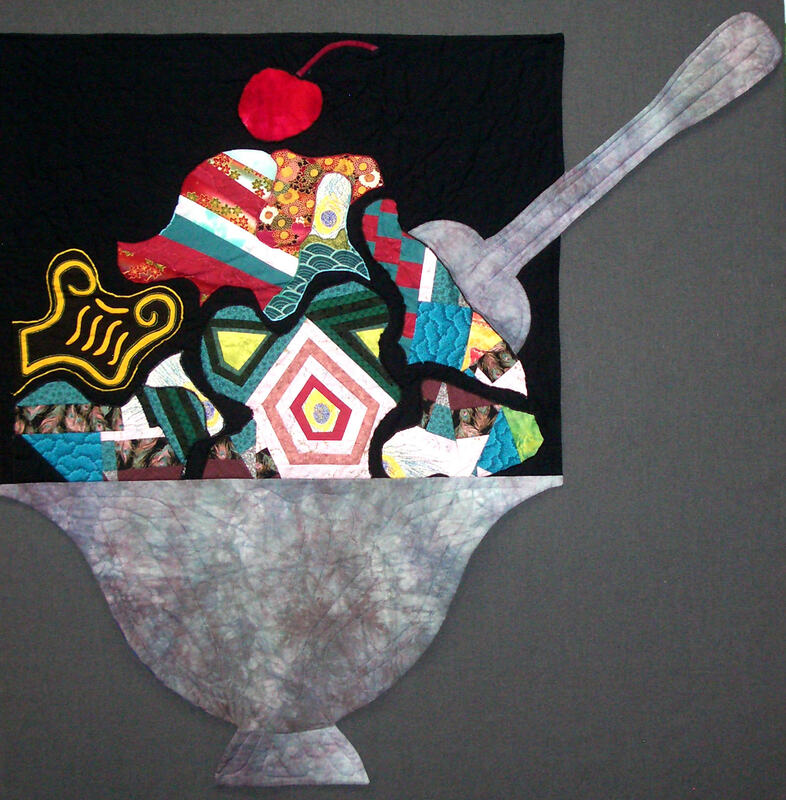 The shape of the dish is the shape of the lower half of the quilt. I was very pleased and named it “Puzzling Spumoni”! All but one of the other pieces in the challenge turned out great. We each tried new techniques and grew as artists while having fun. I highly recommend trying an Anything Goes challenge with your friends. If you’d like to get in on the Anything Goes challenge I’m participating in, our new Milwaukee area fiber art group is called Thread Benders and we will be meeting the third Wednesday in September in Brookfield. Email me for more information! I think I say this every year, but the Madison Quilt Expo this past weekend was the best yet! There was something for everyone and it was all very well done. Thanks to everyone at Nancy’s Notions and Wisconsin Public Television for making this great event a reality. I had the blessed opportunity to share my Border Boutique lecture each afternoon to the largest crowds I’ve ever had at Expo. I didn’t teach a hands on workshop this year, which gave me much more time to enjoy the show. And enjoy it – I did! If you want to see loads of great pictures of the quilts, vendors and events from the show, you can go to the Quilt Expo Facebook page at: https://www.facebook.com/search/top/?q=quilt%20expo. when the UW marching band made a surprise visit! You never know what you’ll see at Expo! While looking at the quilts I ran into May. A while back she learned my drafting technique for the Mariner’s Compass and, while spending time with her grandchildren, decided to make a necklace using Shrinky Dinks™. I love it! It may have to be my next grandma/Sommer project. This large and exciting exhibit filled a long hallway at Expo, and were arranged in spectral order. I noticed that one of the monthly inspiration blocks was the Monkey Wrench. You may remember a “New Quilt From an Old Favorite” Monkey Wrench quilt I made with my friend, Sharon Rotz, a few years back. It measures 60″ square, and contains telescoping monkey wrench blocks, quilted with more block outlines and trapunto monkeys chasing each other around with wrenches (you’ll have to look closely to find them). It was great to reconnect and spend time with many friends. Thanks especially to my dear friend, fellow teacher, and roommate, Laura Krasinski. She always makes everything extra fun. And I’d like to close this post with a picture of the Viewer’s Choice award winner from this year’s show:”He Who Guides Me” by Mary Buvia of Carmel, Indiana. It was inspired by a picture her husband painted. Awesome! I hope this isn’t too obnoxious, but AQS sent it to me – and I’m passing it along 😀 ! You may remember a quilt I posted about a few months back, made with Spandex, and named Forty Wonderful Years (click here and here for both of the posts about that quilt). It was made for a Milwaukee Art Quilter’s challenge called “Art Deco”. Eight fiber artists made quilts to fit that theme and we entered them in the American Quilters Society show in Grand Rapids. The show was this past weekend and we took second place! I’m honored to be a part of this winning group! And I’d like to close with a wonderful tip/tutorial from the AQS blog – On-Point! In it they describe a great way to keep organized during a project, using sticky notes. It’s a worthwhile read and you can see the whole post at: http://www.quiltviews.com/quilters-best-friend-sticky-advice! Then sign up for their blog to receive all of their great tips. A few weeks ago I had the wonderful opportunity to judge the Everygreen Quilt Show in Ashwabenon, WI. They put on a terrific show – with over 300 quilts! We had a great team of judges, and the judging coordinator, Lindi, is very well organized, and a delight to work with. In fact – everyone at the show was great! One of the categories I was asked to judge was the guild challenge. This year is was “Sixteen” for the year 2016, and each person had a challenge fabric that needed to be visible in the quilt. The ingenuity and talent of the participants was amazing. They were all such fun to view. But I just had to share the first place quilt. It is called “Sixteen Square Feet”! Not only does Carol have a delightful sense of humor, but she has the skills to put her thoughts into fabric in an amazing and technically successful way. From the cuffed/creased pants with loafers, to the satin “polish” on the flip-flop wearer – her attention to detail blew me away! Thanks for letting me share your quilt Carol! The other fun story from the show concerned the Best of Show winner. At the end of the day of judging, we put our heads together and give the “big” awards: creativity, best workmanship, judges choice and best of show. Then, and only then, do we get dinner 😉 . Lindi took us to a restaurant for a delicious meal. This is where we met Sheri, our lovely hostess for the night. Sheri graciously offered her home to Margaret, Carol and me, and took very good care of us. The next morning we all returned to the show for our judge’s tour and Lindi informed me that she hadn’t realized the night before, but Sherri’s quilt had won Best of Show! What fun it was to find her and give her the good news! Sheri is a very talented long-arm quilter and she does quilting for hire 🙂 . I’d like to close this post with the quilt I awarded my “Judges Favorite” ribbon. Kim Frisk made this lovely work of fiber art, called “Wherever the Wind Blows”, from rust dyed fabric she’d created using steel wool. She said the fabric reminded her of a map, and that was her inspiration. The appliquéd ships and pieced mariner’s compass came together in a beautifully balanced and intriguing work. Kim’s quilt won the show’s creativity award also. I can’t wait to try rust dyeing myself! It was a great show! Thanks to Lindi and all of the Evergreen Quilters for allowing me to be a part of it! I’ve written before about the Wisconsin Museum of Quilts and Fiber Arts in Cedarburg, WI, and that’s where the second completed UFO I spoke of last week is right now. WMQFA had it’s beginnings in the Wisconsin Quilt History Project – documenting quilts in Wisconsin. Then a farm was acquired and the fundraising was begun to turn an old barn into a museum! Before the barn was renovated, I was at a fund raising event there, and took pictures of some of the buildings. While on a teaching trip to Alaska (click here to read that post), I stayed with quilting friends and had time to Repliqué two of the “building” blocks. Each Spring Cedarburg has a Strawberry Festival, and each year the WMQFA has a strawberry challenge. When I got the entry form for this year’s Strawberry challenge, I knew the time to finish those blocks had arrived. I completed the third “building” block, added patches from a “fruit” fabric, bordered, quilted and bound it all in time to drop it off at the Museum – 4 hours before the deadline. Sew, what does this have to do with couching? Well, when I’d completed the quilt top, the black fabric was overwhelming. I didn’t have much time to come up with a fix, so I did a bit of quick noodling, and decided to couch red yarn inside the black border. This is a “go to” technique I’ve used before and it’s a goodie. To begin, I thread the machine with a color thread to match the yarn, and set it for a zig-zag stitch wide enough to cover the yarn. I leave a 3″ tail of yarn at a corner, lay the yarn in the ditch of the border seam, make one stitch in the yarn at the corner to anchor it, and zig-zag it in place – pivoting at the corners. When I reach the end, I thread the yarn tails into a large needle and bury them in between the quilt layers. I had a great time quilting the border with words. Then I needed a name. When nothing clever came to mind, I asked Sommer who said, in matter of fact 4 year old fashion, “Buildings and Strawberries”. My friend Sonja created a fascinating piece of fiber art for the contest also. My quilt, Sonja’s, and all of the entries, will be on display at the museum in Cedarburg the weekend of Strawberry Festival – June 25 and 26! Please let me know if you see it there 🙂 ! Around the Square Challenge – groups are made up of 6 or 7 participants. A list is made of the members of each group so the projects can be passed around in order. 1. Each participant picks a theme for their project (examples could be: Noah’s ark, snow people, up north, a day at the beach, etc.). 2. Draw a 4″ grid 8 x 10 on a piece of flat quilt batt – orientation is your choice. 4″ is the finished size of all the squares in the quilt, so pieces will need to have seam allowance added. 3. 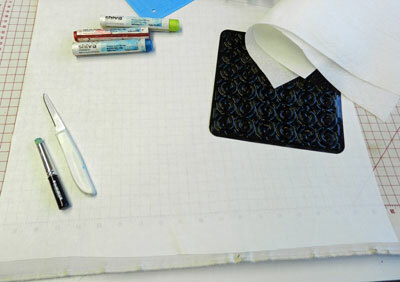 Create a block in the chosen theme to cover a 16″ x 16″ square or a 12″ x 20″ rectangle (plus seam allowances). Safety pin in place somewhere on the grid. Once begun, this block may not be moved. 4. Place in a traveling container along with any fabric or embellishments that can be used in the quilt. A “travel journal” and/or ready-to-sign label may be included also. 5. Projects are passed to the next quilter on the list and they are to make blocks to cover 12 squares on the grid. This could include an 8″ finished block, two 4″ x 8″ blocks, and four 4″ blocks, or other combinations, but no additional block can be as large as the original. These blocks are safety pinned over squares in the grid and may not be moved. 6. The projects are passed until all participants have worked on each one. The traveling containers are then returned to their originators who will add blocks to fill any open squares, and finish the quilt. They may move the blocks around on the grid if desired. The quilt needed a lot of “in-the-ditch” quilting. This is my least favorite way to quilt, but a few of my friends had mentioned using an “in-the-ditch” foot on my sewing machine. It turns out I had just the foot, and it helped. It isn’t perfect, but I was pleasantly surprised by how well it worked. The rest of the quilting was done free motion and that was much more fun. Binding was added and now it’s done – in plenty of time for winter! Here’s the label that traveled with the project, and is signed by all the talented quilters who made it such a wonderful quilt. Thanks ladies! I love winter, and I love my winter quilt! Admit it – how many of you out there love winter too? Stay tuned, next week you’ll get a peek at my other recently finished UFO! This week I’m posting to my blog from a car in the middle of Illinois. What an amazing technological age we live in: I can connect my laptop to the personal “hotspot” on my phone, and be on the internet while driving down the road! Wendy and I are on our way to Quilt Week in Paducah. This year we have the wonderful opportunity to decorate the windows of Tribeca restaurant with our quilts, as part of the Quilt Week contest held downtown. If you’re in Paducah, please come by to see them (on the cobblestone alley next to the Yeiser gallery). You may remember a post from last year that included some wonderful multi-media art from a church in Wales, WI. I saw those pieces because I was invited to share some of my quilts, and my quilting journey, as part of the morning worship service. It was a very interesting morning! Each year Jerusalem Presbyterian Church invites an artist to create art as a part of the worship service. Painting a picture in that time frame might be possible, but making a quilt presented some problems. I worked with Pastor Petterson to blend my fiber art process into the service. What we decided would work best was to invite members of the congregation to bring a piece of cotton fabric. These pieces were collected before the service and during the service I sorted them by value, trimmed them to size and laid them into a pattern while Pastor and I compared these processes to what Christ does in the believer’s heart. The members brought some very interesting pieces (most of them were not quilters 😉 ). But it actually went quite smoothly and it was a lovely time of worship. This brings me to this week’s post. I was asked to complete this piece of art and after much thinking and prayer, I finally came up with a direction, and the quilt is done! with spiral quilting in the background (notice the church block in the lower right, that was cut from a polo shirt). I plan to present it to Pastor Petterson and the church family in the near future. What a joy to have been a part of this worship project, and to see it come to fruition! It causes me to think of one of my favorite Bible verses – Matthew 5:16 “Let your light so shine before others, that they may see your good works and give glory to our Father in heaven”. These blocks were made by an Amish friend of the owner, in all different sizes, and are kept in the vintage Santa box. She now has the blocks together, ready for layering and quilting! With one block much bigger than the rest, and the remainder a variety of sizes, turning them on point with “float” between the blocks was a great way to put them all together! I shared this technique in a post last year (go to: http://chrisquilts.net/blog/?p=5861 to read all about it). Great job Joyce! Thanks for allowing me to post the picture of your lovely quilt top. PS My myriad of “house” blocks from that post are still lovingly stacked in a very tall pile – still “marinating” 😉 . Aren’t they lovely? I have an entire lecture focusing on using Ombré, or gradation, fabrics in your quilts – with loads of examples from traditional to artsy! You can find the lecture information here: http://www.chrisquilts.net/classes/ . I would be thrilled to present it to your guild 😀 . Please email me if you’re interested. To purchase the fabric from AQS click here. Blocks, Blocks and More Quilt Blocks! In my series of posts about my Lunch Bunch quilt, I asked you all to send me a picture of your stack of challenge blocks. These were the three photos I received (thanks ladies – and no names are included so as not to induce guilt)! I hope this may encourage you to put them together, and I can’t wait to hear all about it 😉 . If you have been meaning to send me a photo of your stack of blocks – there’s still time – just email them to me. On this same topic of bunches of blocks that are waiting to become a quilt, a few weeks ago I did a class on Repliqué for the Chocolate City Quilters in Burlington, WI. They are a really fun group and they did a great job creating their house blocks. Whenever I teach my Architectural Repliqué class I make a sample house block along with the students. During this class I actually counted them only to reveal that I’ve taught this particular class 70 times! I thought you might like to see some of my more “interesting” ones up close. Who knows when that will be? If you are interested in my Repliqué technique, you may purchase either of my books on the subject at: http://www.chrisquilts.net/books/. If you’d like to have me present a class for your guild, please send me an email at clkquilt@gmail.com. We all made it happily home from the Sisters Quilt Show, with lots of great pictures and memories (and more than a little fabric). The shops and vendors were great, but I think Wendy and I really enjoyed looking at the wide variety of quilts most of all. We were especially pleased to run into a mutual friend from Wisconsin, Karen Lorenz, and to meet her sisters (or was it sister-in-laws?) who live in Oregon. A few years ago they all went to the show and bought the same kits. They challenged each other to make them and enter them in this year’s show – and they did! We really didn’t have a planned walk as Wendy and I traversed Sisters, but we both agreed we found our favorite quilt hanging from one of the last buildings on our route. Many of the quilts were hung in groupings and this grouping was of a challenge organized by a local guild with the theme being the 40th Anniversary of the Sister’s show. This quilt is called “The Heart of Sisters” (and our Quiltinas loved it so much they jumped into the picture). the 3 Sisters mountains for which the town is named, the Stitchin Post itself, a row of quilts, and even a fabric printed with quilters. What wonderful attention to detail! As we stepped back to get a distance view, we nearly ran into the maker and her husband 🙂 . We immediately felt a bit guilty for having held the dolls up to her quilt, but she was fine with it and so happy to tell us all about her labor of love. She even agreed to be in a photo. They said they moved from San Jose, CA and liked the small town feel of Sisters. She reiterated how quilting and the Stitchin Post really helped to make her feel a part of this community, which she is now proud to call home. Great quilt Janet! Thanks for sharing it with us! I also wanted to remind everyone that registration is now open for classes at the Madison Quilt Expo. Please click on the button below for all the information! A few year’s ago I met a very talented and energetic quilter named Kim Lapacek. She had attended my Mariner’s Compass lecture at a Quilt Expo – and she was so excited about the technique that she made a few compasses and sent me pictures. I was impressed! Kim and her husband have three young girls and run an apple orchard in Poynette, Wisconsin. I must tell you, she is a fantastic quilter (or at least a fantastic “topper” – she admitted her Aunt-in-law, Barb Raisbeck, quilts most of her quilts)! She is also a very entertaining speaker. I would highly recommend her for your guild or quilt group. It uses Cherrywood fabric and these quilts need to be 20″ square. For background information on this challenge click here! For the current challenge info click here! Kim said that over 70 quilters made quilts for her most recent challenge! And you can be a part of the fun. If you decide to take one of her challenges, please let me know – and send pictures! To contact Kim and have her speak to your guild, simply go to her blog: http://www.persimondreams.blogspot.com/. and each of the 9 squares were printed out full size. We each chose the sections we wanted to make and got together when most of the blocks were done. At this point we decided it might actually work – and scurried to finish all the blocks. The blocks were sewn together and Sommer helped me layer the quilt in a frame. So, Linda and I had lunch this past Friday at Grace once again and I was surprised to find that the crumbling base on the cross in the church yard had been repaired and the large dogwood branch cut away. It looks lovely, but I think the photo from last year was much more interesting 🙂 ! I spoke with some of the ladies from the church and they’re very interested in having it hang at their quilter’s luncheon in 2016. What a blessing! I’d like to leave you with a few more photos from the AQS show. One of my favorite quilts (and there were many) was made by Nancy Prince. I couldn’t take my eyes off it. The figures in the foreground were machine embroidered and then applied to the quilt. It was amazing. A fun way to get around town was to ride in the bicycle rickshaws provided by Quilt in a Day. Linda and I really enjoyed an evening Ghost Walk tour through the streets of downtown Paducah. We were led by a costumed guide from the Market Street Theater who entertained us with many gruesome tales. And at the end of the day on Friday, Lisa gave new meaning to the phrase “shop til you drop”. I went up to her and asked if she was alright and, when she assured me she was, she gave me permission to take her picture. We introduced ourselves and had a nice conversation 😉 ! Now I’m home, having great fun reliving a wonderful week in Paducah, and looking forward to Quilt Week 2016! Floss Frenzy Challenge – Revealed! To begin this post I’d like to share “my challenge project”. I cross stitched a cover for my Iphone. I’d seen something like it on Pinterest and felt it was a great use for embroidery floss! The problem is that the case didn’t fit my phone as tightly as I’d like, so I gifted it to my friend Maria – who was thrilled! I enjoyed making it and I’m glad it found a good home. After issuing the challenge I realized that I still had way more floss than I could ever use, so I sent an email out to the missionaries my church supports, asking if they could use it in their ministries, and quite a few of them responded. It’s been fun to see how far the floss is traveling and to hear about the crafts it’s being used for in Peru, Mexico, Estonia, Sweden and even Micronesia! So now – it’s time for the challenge. Please remember that most all of the floss “three packs” were chosen at random by me – and please only vote once 🙂 . A wall quilt of a vase filled with crocheted button flowers. Thanks to everyone for the great response. I loved seeing what the floss became. Finishing by the deadline makes you all winners in my book, but it will be fun to see which project wins the prize! Some time has passed since I shared the story of my good fortune at having received a box filled with DMC embroidery floss (if you don’t remember that story, you can read about it by clicking here). I so enjoyed reading all the comments made to that post. Since then, I’ve had many people ask me if I’ve decided what to do with it all. There were many comments recommending I give it to charitable organizations, and I’m definitely planning on doing some donating. One of the most popular suggestions was to give a packet of floss to volunteers who like to embroider, and have them make blocks to be put into a thank you quilt for Rowland and Carol (the owners of the B&B who gave the floss to me). I think that’s a wonderful idea, and I’m searching out block patterns to share, along with the floss – eventually. I will fine tune these ideas and let you in on my plans in a future post. But I have enough floss to do a number of things and this week I’ve decided to present a Floss Frenzy Challenge !!! * Make “redwork” (or “bluework”, or “yellowwork”, or whatever color you like) blocks and stitch them into a quilt. * Tie a quilt with the floss. * Embellish a tote by couching the floss onto it. * Quilt a table runner using the “Big Stitch”. * Find some quilterly thing to do with counted cross-stitch. * Use the floss as a closure on a quilted cover for your e-reader. The challenge will happen via the United States Post Office, and the internet. 1. Email me your snail mail address (for your own privacy, please don’t put it in a comment to this post). My email is: clkquilt@gmail.com. 2. I will then mail you 3 skeins of floss. If you want it to be a real challenge, I will randomly choose the colors. Or… you may give me a suggestion of which colors you prefer. My goal is to have many people participate. 3. Make something with it! Anything you choose! No size requirements! No real rules at all 🙂 ! Make something you can use, or try a technique you’ve been wanting to play with, or make your dear Mother-in-law a candle mat for Christmas. It’s up to you. 4. Email me a picture of your project by February 28, 2015! That should give you plenty of time and something to do on cold winter nights (if you live somewhere with cold winter nights). 5. I will put these pictures into a virtual quilt show on a page on my blog for all to enjoy! I’m hoping to get good participation, so please email me today! At my guild Christmas party the “Special Projects” committee organized an “ugly fabric” exchange. We were to put 1 yard of an ugly fabric in a brown paper bag and we played a game to exchange them. We were to do something (anything) with them and have it ready to show at our July picnic. I was rather pleased to receive a fabric I didn’t consider ugly – in fact – I liked it! but the star blocks were delightful! Here are just 3 of the 8! It’s hard to believe one fabric could provide this much variety in the stars. And the remaining 5 were just as interesting. I decided to set them on-point, with a “zig-zag” type of sashing. I have an antique quilt from the 1800’s set this way and I’ve always been intrigued by it. I discovered that it is not a very quick or easy pattern to piece, so it will never be a class, but I thought it was very pretty. At this point it seemed obvious to me that this would make a lovely Spring table cloth. So I added a striped border – and I’m very happy with the results. Have you participated in an “Ugly Fabric” challenge? Any pictures you’d like to share :-)? Next Saturday Wendy and I will be leaving on our Sew We Go adventure to the Baltic Sea. It’s promising to be a wonderful trip and I’ll have lots of pictures and stories to share when I return. So, I’ll be taking a two week vacation from blogging. Here are a few extra pictures about my latest quilting/sewing adventures to hold you over until we return :-)! Since returning from Paducah, I’ve been in a “get er done” mood. I found a pattern for a sun dress at one of the downtown vendors during the AQS show and Wendy discovered an adorable owl fabric at another, so I made Sommer a sun dress – just in time for our warmer weather. It was a super- simple pattern and the straps criss-cross in the back. The black and yellow polka dot bloomers are adorable, but they didn’t show in the picture :-(. I also made Mike a pair of jama pants (which he chose not to model for the blog). Then I was ready to start something “new” and I dug up a pattern I purchased years ago “whose time had come”. It was a small, “Springy”, three panel hanging with a sweet, free standing frame. I decided it would make a perfect Mother’s Day gift for my Mom and finished it last night. Mom loved it (or at least she said she did :-)! Happy Mother’s Day to all you Moms out there – and Happy Spring to everyone! What a beautiful day to baste a quilt in the driveway (to read a previous blog on my quilt basting frame click here :-)! A few months ago I blogged about the Double Wedding Ring pattern and how it was used in a Milwaukee Art Quilter’s challenge called Objet D’Arc. To read that post click here! This was the challenge exhibited at the Milwaukee Machine Quilting show this past weekend and Susan commented on my piece because it is a bit unique. It’s 3-D and reminiscent of an accordion door. About 13 years ago my friend, Tricia Spitzmueller, made an “accordion door” style quilt and I was inspired. I came up with my own technique and “Reflections of My Quilting Heritage” was the result. When viewed from the right (top photo) you are looking at my sewing journey beginning with my great, great grandmother who made traditional quilts by hand to keep her family warm, through my mom teaching me to sew, then my friend Sharon teaching me to quilt and finally to my entrance into fiber art. Each of the women in my quilting journey are reflected in a hand mirror. The view from the left is a quilt in which one half is a reproduction of a log cabin quilt I own made by great, great grandma Mary. The other half is a variation of my Parallelisms technique. I had just started making art quilts and so it was current to the time of the quilt. This project was actually made from three different complete quilts, two of which were cut into chunks and sewn back together. This unit then hangs on the third quilt! A second quilt was made as a reproduction of the traditional double wedding ring design, but in more modern colors. This was also layered, quilted and marked. I feel like I’ve only begun playing with this technique and the next project is in the planning stage already :-). Have you created any REALLY 3D quilts? We’d love to hear about them! Quilt Expo is always educational, inspiring and fun. I’ll be teaching there once again and I hope you can be there too! “When I heard that Gilda’s Club was opening in Milwaukee and my local quilt guild, North Shore Quilter’s Guild of Milwaukee, had been asked to donate three quilts for their community room, I knew I wanted to be involved. When I saw the room, a large narrow, brightly lit space, and learned the community room was where many of the club functions would take place, I knew immediately quilts about community was what I would want to see on the far wall. After the three quilts were designed, I realized the quilts needed not only to be about community, but also the “look” of being made by the community. I presented the idea of a “slice” quilt to North Shore Quilter’s Guild and asked if they would be interested in participating. Even though it was a very ambitious project, I received an enthusiastic “Yes”. Members of the guild made the 90 blocks. I assembled them and Terri Kirchner expertly long arm quilted them. On another note – Life has been crazy and wonderful for the past 2 weeks. Our oldest grandchildren, Hanna (7) and Willy (5) have been visiting us from Washington State. I was blessed with the opportunity to fly out and get them on June 18th and will be taking them back home this Tuesday. Aside from the blog topics I had planned ahead of time, nothing but the kids has gotten much of my attention recently. We’ve created many, many memories and I thought you might enjoy a picture of us at the Hartland parade today :-)! Tomorrow Hanna and I will be finishing the quilt she is making for her cousin Sommer. Stay tuned for pictures of that adventure! The Milwaukee Art Quilters is a very talented group of artists and I am honored to be a member. Recently we had a showing of a group of our quilts that were made as a tribute to a dear member who passed away in 2011. Nancy Kimpel was not only a skilled quilter, but her many talents also included knitting, and dyeing of fabric and yarn. She was a great inspiration and encouragement to the group. When she died her dear husband John and close friend, Mary Ellen Heus, decided to divide up her hand dyed fabrics/threads into 40 bags, bring them to a meeting, and challenge members to create a piece of fiber art from the contents of the bag for an exhibit to be called “Inspired by Nancy”. We all clamored for a bag. The fabrics and hand dyed perle cottons in my bag were lovely and I decided that I didn’t want to add anything to them. They were interesting enough to stand alone. I’d always wanted to play with overlapping geometric shapes in a positive/negative fashion and the patterns in one of the pieces of Nancy’s fabrics gave me a great place to start. So I began drafting and drawing until I got a design I liked, used my Repliqué technique to appliqué the top and then had a lot of fun quilting it all. 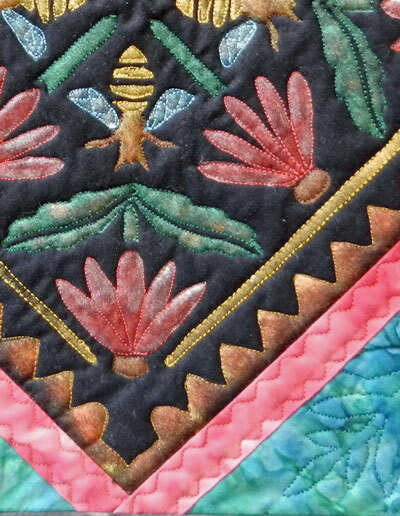 I was pleased with the effect of extending the designs from the center into the border with the quilting. The resulting group of quilts were amazing. If you missed the exhibit at UWW, you can still see the quilts on our blog: http://milwaukeeartquilters.wordpress.com/. And a cultural stop too! What will happen when Tilly gets to her new home? Will she behave? Be here next week for the continuing adventures of the Quiltsissies! I originally made the quilt round (unusual shapes were allowed in the challenge rules) and it was a bit tricky to hang. I actually inserted a length of 1/4″ wide plastic tubing into the binding from behind, that went all the way around, and it held the quilt in shape quite well. The problem was that none of the other quilts entered were unique in shape. When mine was one of the 8 selected to go to the Ultimate Guild Challenge contest in Grand Rapids, I decided to place it on a quilted background square so that the group would look more unified and this is how Czech Aurora looks now. So here’s where you come in. I’ve been looking for venues to share these exciting quilts. Does your guild have a quilt show that might be interested in hanging Bead Inspired? Is there an art museum or gallery in your area that might be a good fit? I’d really appreciate any ideas you have. Please send me the contact information for any possibilities and I’ll take it from there. Thanks! 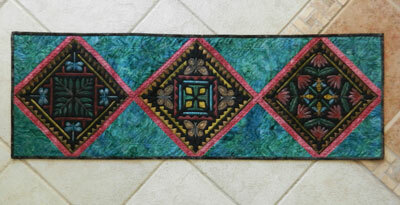 Our latest challenge in the Milwaukee Art Quilters guild is entitled Bead Inspired. We were to create a small wall quilt that was inspired by a single bead or button which had to be attached to the quilt. About 20 of our members participated in the challenge and 8 of those quilts were entered in the Ultimate Guild challenge at the AQS show in Grand Rapids, MI ….. and we won third place! To see a video of all of the winners in Grand Rapids click here (our quilts are about 4 minutes into the video ). While staying (and shopping) with my friend, Evelyn, in Arizona last January I found a striped fabric that was just what I needed to begin working on my challenge quilt. Evelyn is quite skilled in the use of Shiva Paintstiks™ and she encouraged me to use them in the quilt (click here for my post on how to use Paintstiks). I did just that plus some intense fussy cutting of the stripe to create my design. The button is at the center of the quilt and the Paintstiks create the outer 3 rings and the “half moons” inside the gold ring. We will be posting pictures of all of the Bead Inspired quilts soon at www.milwaukeeartquilters.wordpress.com. Have you used beads or buttons on a quilt? If you have, and you would be so kind as to email me a picture at: clkquilt@gmail.com, I’d be happy to include it in a future blog! An FYI for Wisconsin Quilters! A few weeks ago I asked if anyone had a vintage Burgoyne Surrounded or Pineapple Log Cabin quilt they might be interested in selling because I’m in need of those patterns for a new quilt lecture I’m putting together. I already had a sample of Mariner’s Compass and Rose of Sharon, but I was thinking I’d like a better example of those too – if I could find them. As a thank you for donating the quilt to the contest, Judy sent me a copy of her wonderful cookbook and I just knew I needed to share this information with you. I asked Judy to send me something to put on the blog and here it is. Enjoy! The overwhelming need to feed needy children inspired Buckboard Quilts to sponsor the “Food for Body and Soul Touring Quilts Contest and Exhibits.” The exhibits are touring the U.S. for three years with all proceeds from the $100/week-end exhibit rental and accompanying 1905 Cookbook—Food for Body and Soul going to local soup kitchens and food pantries. See http://www.heavenlypatchwork.com/food_for_body_and_soul.html for quilt photos, entry and rental forms, calendar of shows and sample recipes and stories. These two hundred-fifty 22×22” and larger touring quilts capture the essence of pioneer cooking, ethnic customs, vintage kitchen collectibles, passion for food, family, celebrations and holiday traditions, food stories from the Bible, fighting hunger; feeding hope–anything and everything food or anything that feeds your soul like quilting, grandkids, music, art, gardening, etc. It’s not too late for you and your children to enter your 22” quilts to receive a free copy of the 1905 Cookbook–Food for Body and Soul with each entry, free advertising on the story label and a chance to win $2500 in prizes and 33 rosette ribbons. or calling 405-751-3885. Displayed in as little as 20 feet, sixty 22” quilts can be hung in 40 minutes displayed 3 up, back to back, or spread out for maximum effect. Drop-down labels feature heart-warming stories. Judy Howard’s new cookbook for cooks, foodies and historians is based on recipes from pioneer days in central Oklahoma. 1905 Cookbook: Food for Body and Soul will inspire today’s cooks regardless of age or sophistication. Recipes like Molasses Drop Cake and Delightful Biscuits or Delicious Chicken Pie and Roast Beef with Oyster Dressing entice the taste buds and make you want to keep this book within easy reach to satisfy your body and soul. In addition to this amazing and often amusing collection of 300 epicurean delights, Howard’s book is flavored with 200 turn-of-the-century photographs, 1905 merchant ads and stories of the 89er/pioneers who compiled the original cookbook found at a flea market. This cookbook will complement any cook’s recipe collection and is the perfect gift at discounted price of $12.95 if ordered on http://www.heavenlypatchwork.com/1905%20Cookbook.htm. Enter your 22” Food Quilt today to help feed needy children. And reserve the $100 exhibit for your next show. She said she challenged herself to play with some new techniques. The window is actually a wholecloth quilt with oodles of stitching. I was particularly intrigued by the attached sewing machine. Too clever! Thanks so much Evelyn for sharing your view and your quilt! This got me to thinking about how photographs can inspire us. That train of thought led me to think about some photo play I’ve been doing lately. My friend Di invited me to join a photography blog she runs for a group of friends. The idea is to take a picture every day and strive to improve your camera skills. She posts a calendar each month with a theme for each day (yes, we try to post a photo a day!). I’m really enjoying the challenge and I feel my skills are improving. I’d like to share my three favorite photos from the past few months to see if they might inspire you to do a little photo play of your own. The first one is a winter scene from the beginning of March. We had 2 geese take up residence in our pond. As the snow began to melt, I got this up close shot of the ice melting on the creek. This next one was taken more recently. Mike and I went for a canoe ride just before sunset and the temperatures dropped enough to cause a mist to rise off the water. It was beautiful! I can’t resist just one more – my most recent picture of Sommer Elizabeth (Grandpa and I are not only surviving daycare, but loving it!). Have you taken any shots you’d like to share? Please email them to me and I might just share them in a future post! PS Just a note on our Sew We Go Italy adventure. We have 21 people signed up and one of our quilters is looking for a roommate to share the fun. If you were thinking about joining us, but didn’t have someone to travel with, please let me know. 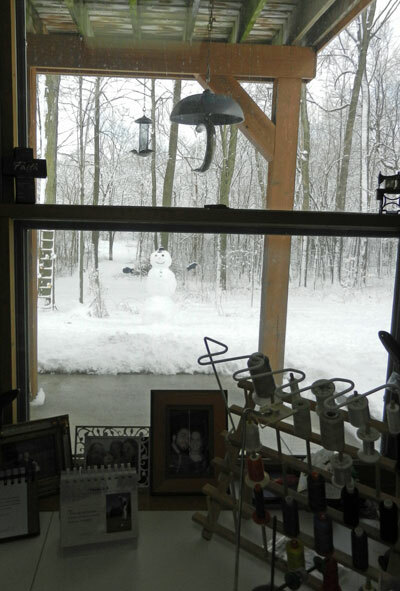 Last week’s “snowman in the window” picture is but a chilly memory, considering we’ve had temperatures in the 70’s here for over a week. That is not just odd – it’s unbelievable for March in Wisconsin. 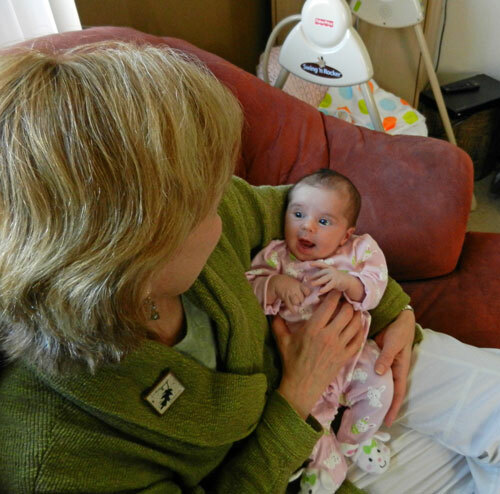 Many are speculating as to the reason, but I have my own theory – my granddaughter was born this past Monday and her name is Sommer Elizabeth. So Sommer is here :-)! 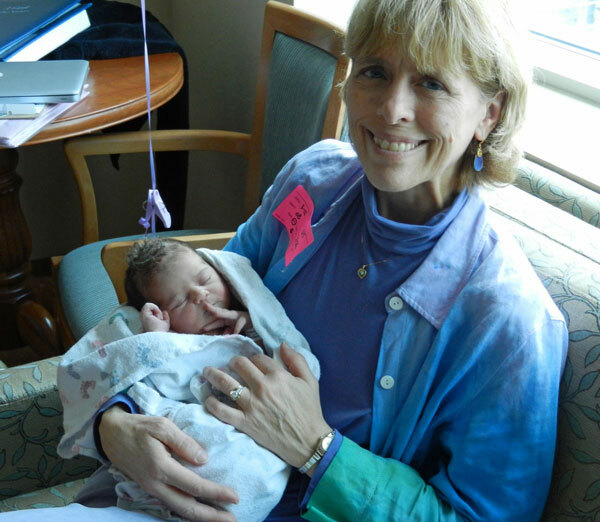 6 lbs 15 oz and 21″ long, with lots of dark hair ……. we’re all thrilled! Thanks for letting me share our joy. So what does the view from my window look like today? 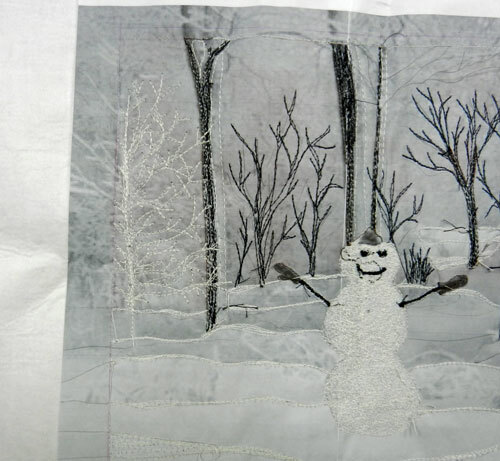 Quite a change, but I am still excited about making a small quilt from the picture with the snowman. I’m thinking of thread painting the entire scene on a vintage white damask napkin. I’ve never thread painted an entire scene and I think it will be quite challenging. I think this challenge should be about trying something new. A number of you responded to the challenge, and so far 3 have sent me pictures which have been posted to the Window View Challenge page on this blog. Click here to see them. I’m looking forward to receiving more pictures and there is still time to get in on the fun. The quilts can be any size, from a post card on up. The prize will be an autographed copy of my new book: Compass Capers (which should be available for purchase through my website very, very soon). So send me a picture of your view at clkquilt@gmail.com, and join in on the challenging fun! The weather in Wisconsin has been unique this year. A week ago Friday we had a very wet snowstorm that left 8″ of beauty all over the woods. After clearing the driveway Mike invited me out to build a snowman. It was dusk and the scene was lovely! 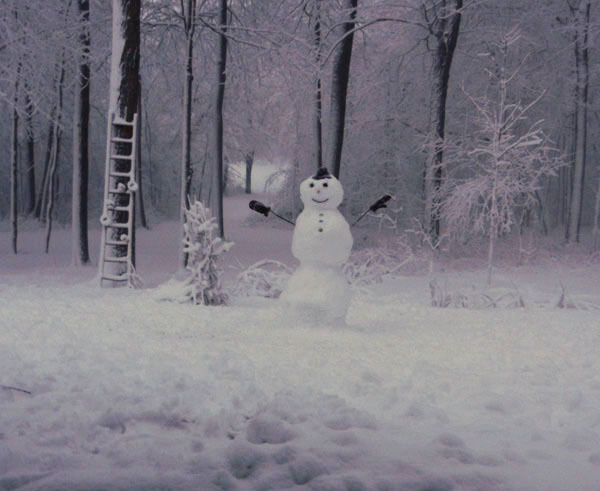 By Sunday the temps were heading up into the 60’s and I discovered snowmen can’t do backbends. So what does this have to do with quilting? 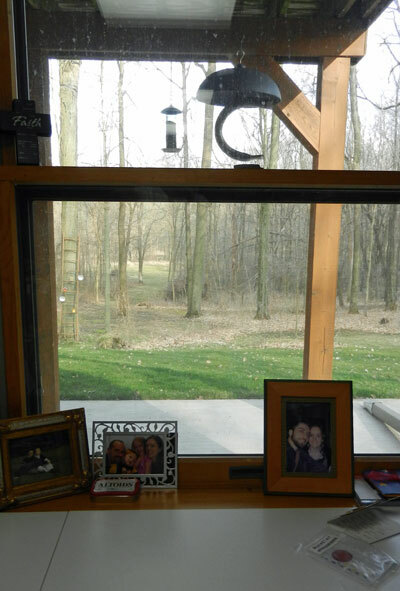 Well, this was the view I enjoyed through the window above my sewing machine while quilting on Saturday. I had an overwhelming urge to create a quilt about it. Then I got to thinking that many of you probably have inspiring views from windows in your home too. This led to the idea of holding my first blog challenge! I hope many of you are up for this. It’s quite simple. 1. 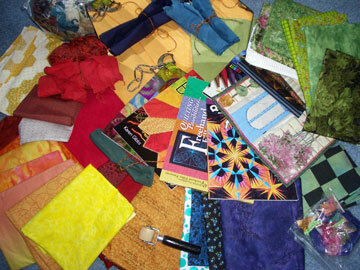 Email a picture of your view to me at: clkquilt@gmail.com by next Sunday, March 18th. 2. I’ll post them to a “Challenging Views” page on this blog for all to see. 3. Then make a quilt inspired by your view, any size, any shape, any technique (small is good). You could repliqué the picture, but there are many other ways to be inspired by it: create a traditional pieced pattern using the colors of your picture, pick any item in the photo as a theme for your quilt or ……..any other direction you care to go. 4. Send me a picture of your finished small quilt by April 1, 2012 to be posted on the blog (that’s the deadline – its not a lot of time, but the project is small – and you’d just put it off until the week before anyways :-). 5. The following week’s blog we’ll have a viewers choice vote and the winner will get a wonderful prize! Here’s a sample to get you started thinking. This is much more involved than our simple challenge, but it is the only other time a window view has been my inspiration. 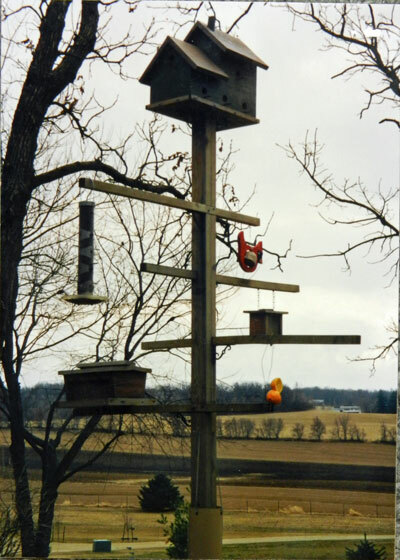 When we lived in Sun Prairie my husband and kids built me a wonderful “aviary” post with bird houses and feeders hanging from it. It stood outside my kitchen window and I delighted in watching the birds each morning. When we had to move I couldn’t take the post with me, so I made this quilt which was inspired by it. Perhaps you’ll think of this as a chance to try a new technique or just play with fabric. I can’t wait to see what you come up with :-)! It took me most of Monday and Tuesday last week to unpack all the stuff I had taken to Paducah, do some laundry and catch up on mail, etc.. At that point I was left with the pile of new stuff I bought at the AQS show. It got me to thinking about quilters and shopping. I’m not sure if this will sound familiar, but there have been many years when I start packing for my annual pilgrimage to Paducah and unearth the complete, and untouched, pile of stuff I had bought there the previous year (a bit embarassing to admit to, but I bet I’m not alone :-). This is rather guilt inducing and I truly dislike feeling guilty, so I’ve come up with a plan. Actually, my friend Laura and I brainstormed this idea 2 summers ago when we attended the Milwaukee Bead and Button Show. We walked out embracing our treasures and decided we couldn’t go back the next year unless we did something with 3 of our purchases! It ended up being a good challenge and we both were up to it. We used our 3 items in a short amount of time and felt quite virtuous. You might notice a bit of fabric. Who can resist? There’s a few books and a bunch of embellishments, along with 1 tool I’ve already used. I’ll tell you about it in a future blog. I believe this type of personal challenge will help you to not only alleviate the guilt, but inspire you to use that great stuff. One additional recommendation is to assimilate the stuff you don’t use into the stash so you avoid finding those pesky piles next year. So………………..have you ever? What do you think of the 3 item challenge? Any additional suggestions? The latest Milwaukee Art Quilter’s challenge is entitled “The Blues”. The quilt needed to be 31″ square, at least 1/2 blue and fit the theme. My grandson Willy has the most beautiful blue eyes, so my subject matter was simple. However, creating him in fabric was truly a challenge. I have done very little in the way of faces, so this was a great learning opportunity. I used a mixture of Repliqué and my version of Caryl Fallert’s Appli-piecing technique, all accented with thread painting. As you can see, the real Willy’s a whole lot cuter than the quilt Willy, but overall I’m pretty happy with my first attempt and have learned a lot. We all need to try new things :-). The one part I was pleased with was his hair and that (along with his eyelashes) was my thread painting adventure. I used a fabric which contained areas of all the right values of golden red to brown, appli-pieced chunks of it together and then the fun began. I changed thread often and truly scribbled horizontally all over. It was freeing and almost fool proof! A great technique to have in your bag of tricks. I hope you have the chance to try it! Thanks to everyone who responded! I appreciate all the great suggestions. Now Wendy and I need to do a bit of brainstorming and share our ideas with the Irish quilters. We’ll let you know what we come up with :-). I’ve recently begun a delightful email relationship with one of the quilters I met in Ireland on our Sew We Go trip last October. Sandlin and I have been sharing stories about our families, faith and quilting. She’s currently making a quilt using Replique for her grandson. It’s delightful and really makes me smile. Wendy and I are hoping to put together some sort of friendship exchange/challenge with our Irish travelers and the Galway branch of the Irish Patchwork Society. We haven’t come up with the details yet and I was wondering if any of you have done long distance exchanges that were successful. The most exciting part was that we were able to send them all to Freiburg and have all 60 hung in their town hall. Then all 60 came here and were displayed at the Civic Center on State Street in Madison. Lastly the quilts were exhibited in Bern before we each got ours back. This quilt has been many places I haven’t. The added fun of this Irish exchange is that we’ve met the quilters from Galway. Now to come up with the perfect challenge (perfect is a relative term :-). Any suggestions? I’m really hoping for some helpful input from all you talented folk! Ta ta til Thursday! The most unique challenge I’ve participated in is among my favorites. A number of years ago the Milwaukee Art Quilters discussed doing a “round robin” sort of challenge as Sarah explained in her comment (thanks Sarah). The theory being that one person makes a block or row and passes it to another who adds whatever the challenge rules dictate and after 3 or 4 additions the originator gets it back. The problem was that fiber artists seem to really dislike rules. So, we did an “Anything Goes Round Robin”. Each participant put something in a bag (block, piece of fabric, or whatever – no rules) and the next person could do anything they wanted to it! After 4 rounds the originator got it back and could finish as desired. The only real rule was that you couldn’t be upset about what anyone did to your item along the way. It began as 3 hexagon log cabin blocks from a failed 1995 workshop where the teacher discovered half way through that the blocks wouldn’t fit together and the class ended. The fabrics were dated and I had no need for the blocks, so in the bag they went. The first person chopped 2 of the blocks up and sewed them back together into a long strip. The second person thread painted a peacock feather on a light pink background and bordered it with the pieced unit. The third chopped again and added a bunch of stuff from her scrap bag. She then cut this new “fabric” into puzzle pieces and threw them in a bag. The fourth artist stacked them into a pile on a black background and put a cherry on top. This is how it was returned to me. I put it in a dish and added the spoon. It is an odd shaped and humorous piece which I love, even though it really doesn’t go in my living room. I learned a lot working on the other quilts and feel its a good excercise in creativity. I challenge you to try it in your own group! I enjoy taking on a quilting challenge! Please understand, I don’t mean that I like it when I’ve sewn an entire seam right side to wrong side and I’m challenged to do 40″ of unsewing! A challenge made by other quilters is what excites me. Whether a fabric is chosen and a variety of stitchers are asked to do something original or an organization comes up with a contest, I can’t resist jumping in. I’ve also been challenged in other ways by some of you through this blog. I’m still thinking about my Liberty of London fabric thanks to the challenge from Pat. That one is in the “marinating” stage :-). What’s the most interesting challenge or contest you’ve participated in? I’ll tell you my favorite on Friday!